Is it a coincidence that if someone is "cracking up" they can be either laughing heartily or losing their mind? Personally, I am going for a little of each. The broken window actually makes me feel more giddy than grumpy. It is our very own broken window. We can fix it when we want to and we do not have to answer to anyone for it. And better still, it came from play. Spontaneous evening ball tossing between two family members led to this event... this rite of passage. 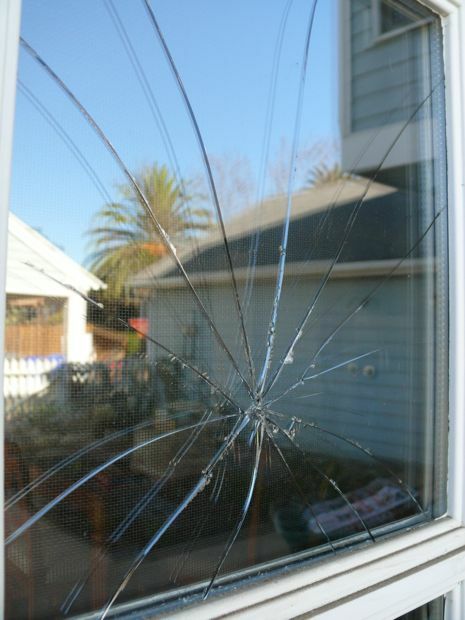 What can be more classic than a shattered window pane from an errant ball? So, what else has me cracking up? Geoff's ankle injury. When the swelling goes down we can get a better prognosis. Maria's mystery fever, which has finally left, but not before we had to postpone her birthday celebration. Feeling old, grouchy, grinchy, overwhelmed, smelly, tired, far behind and after I post this, embarrassed. Yes. It is that kind of morning. And I haven't been anywhere near a Martha Stewart publication, so the feeling that I will never achieve my goals and fulfill my holiday fantasies has been mustered all by my own daydreaming and self-deprecating self. Can you say "self" twice in the same sentence? I am still holding on to my gratitude, still gleefully dizzy with new home joy, but I also kind of want a break. I still kind of want a break. I would appreciate it if all illnesses and ER visits would cease and desist. I would like to have consecutive days of good health, for all family members. It would help tremendously if we could be unpacked, organized and even familiar with our surroundings now. I am going to leave decorating, shopping, house cleaning, parties, outings and hoopla for another wish list. If nothing else, I would love to take a nap. What a great last picture. 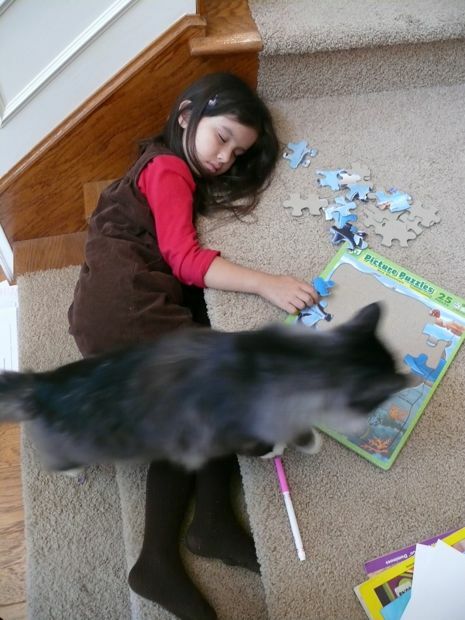 To fall asleep while playing. Joy. You amaze me! One day you are wondering what color to paint the benches, and in the blink of an eye they are already painted! You seem to accomplish so much in such a short time, despite all the medical problems and emergencies going all around you. Oh. And, ouch! And feel better soon(er). I've always thought that, more than anyone I've ever known, you have the ability to deal with what IS and to be willing to plan your joys for when everyone's ready to be joyful (belated birthdays, pumpkins carved in their own good time -- these are the things of great common sense and a healthy sense of whimsical humor). You only think you're not handling it well -- you are actually the poster woman for doing it right. Well. I don't think I've ever thought of a broken window pane in quite that way, but I'm glad you are feeling at home. And the cranberry red looks fab. I think it goes beautifully with the green plants. The broken window reminds me of the time when my brother and I were around 11 or 12 and "playing baseball" in our backyard. We broke a window belonging to our neighbor.... a backside of a garage window! Luckily they were nice neighbors. Sleeping on the steps is a dangerous proposition! 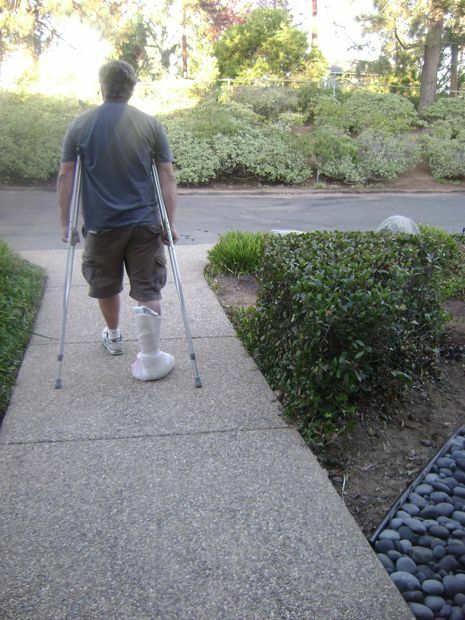 At least you have some crutches just in case! So cute!